Like the high school kid who doesn't get invited to go out partying with the in-crowd, Polaroid decided that the best way that it could turn some jaded heads was with a dramatic reinvention. The company pulled up outside CES with a whole new range of cameras, tablets and a 4K TV, the latter of which was one of a small few that broke the $1,000 barrier. When we went to examine the 50-inch UHD panel, an executive remarked that this un-smart TV would likely get a price cut before it hits store shelves in order to undercut rivals from Vizio and Kogan. Of course, there's no word on just how much cheaper this unit will be, but we figure it'll be hashed out with the accountants in due course. The unit itself, meanwhile, uses an Innolux panel and comes with a trio of HDMI 1.4 inputs in addition to a USB port -- although it's our sad duty to inform you that the latter can only be used for firmware upgrades. The company also believes that most buyers will already own a Chromecast, Apple TV or similar gear, and so omitted Roku's built-in streaming stick tech, putting the gear at a disadvantage compared to the aforementioned Vizios and Kogans of this world. Still, for now, it's scheduled to arrive in May, and for now at least, you can expect to pay $1,000 for the pleasure of mounting it to your living room wall. Nicole Lee counted all 3,840 x 2,160 pixels on these TVs by hand for this report. Ah, Las Vegas, the perfect location for a spontaneous wedding. Earlier today, we witnessed a quick and dirty collaboration between Parrot and Thalmic Labs at CES, where they paired an AR.Drone 2.0 with a MYO gesture-control armband. The demonstrator was able to control the drone's tilt direction by using just one arm, as well as toggling the rotors by clicking fingers. This author gave it a go as well and found this control method to be as effortless as it looked, though due to the WiFi interference on the show floor (ugh, so typical of large events these days), the drone had to stay within a close proximity of the iPad that was relaying the MYO's commands. There wasn't a way to adjust the vehicle's height in that particular demo, but there's no stopping Thalmic Labs from assigning additional gestures for that -- maybe clench fist to ascend and spread hand to descend. Understandably, neither company could confirm whether they are bringing this feature to market, but we'd be very surprised if they don't sustain their marriage moving forward. Every episode of a kid's show follows a similar pattern where the main character will pause, turn to the screen and ask a question to the viewer. Children are supposed to eagerly shout at the screen with the answer. Regardless of what someone says, the character on screen and continue on with the show. If this is supposed to be educational, how are kids really learning anything if they're given the answer anyways? Toytalk, a company founded by veteran Pixar Animation execs Oren Jacob and Martin Reddy, have an app that literally answers this question. The company's first project is called The Winston Show. Its a cartoon app starring Winston and Ellington, co-hosts of a digital talk show which makes kids become the special guests. The best part? It actually talks back to you. Voice recognition software harnesses the iPad's microphone makes it possible for Winston to ask questions, listen to the answer and respond to it. Children can actually have an immersive learning experience since the app is teaching them something instead of just giving them the answer. Despite that, Winston can occasionally provide a generic response if he can't understand the question. Five sketches are built into the application for users to enjoy with over 12 hours of interactive content. Children can choose to compete against a multitude of colorful characters in a variety of quiz shows, create their own story in a segment called Writers Room or just have a fireside chat with Winston on any topic. When I asked Oren what he feature he was most proud of on Toytalk, he said, "Personally I am most proud that our writing never talks down to kids. We believe that kids always have something smart to say and deserve the same from their entertainment.! " Instead of opting to premiere their new product on TV, Toytalk decided to bring The Winston Show to the iPad since Oren considered it to be the most "advanced entertainment platform." Also, children were the ideal target for this program because the founders felt that they would be the most receptive audience. For now, Toytalk is keeping The Winston Show just on the iPad. Season 2 will be coming out this year but the release date has yet to be announced. If parents are seeking a beneficial way to harness technology for their kids, you can download the app for free here. A demo of the app can be seen below. Kansas City's Verrückt water slide is the largest in the world, taller than Niagara Falls and absolutely unreal-sounding. You have to love the creative pursuits of "guy in garage." YouTube user Arc AttackMusic has loads of videos demonstrating his Tesla coils and their musical capabilities. One of the songs in his Tesla coil repertoire is the "Game of Thrones" theme song. We built these little Tesla coils so that we could check them onto airplanes as baggage. We had to test them. That is the reason this video exists. So remember a few weeks ago when Target admitted that hackers had swiped the data of 40 million customers, but no one needed to worry because it was all encrypted? 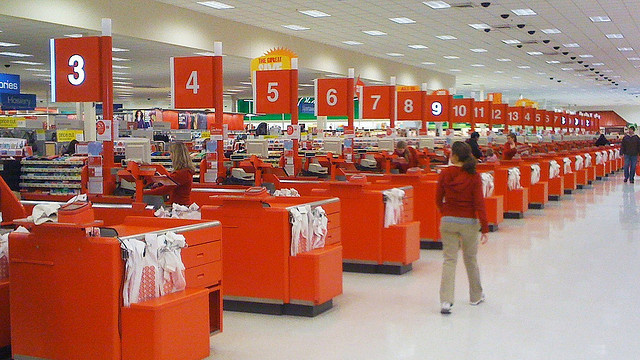 Well, Target's starting to realize that quite a bit more data was swiped than it previously thought—specifically, the names, mailing addresses, phone numbers, and e-mail addresses of 70 million customers. Whoops. And just like that, 2K screens are old news. While other companies announce laptops with 2,560 x 1,440 screens, Toshiba is doing the competition one better: the outfit is showing off a notebook with a 15.6-inch, 3,840 x 2,160 display. Dubbed the Satellite P50t, the laptop has a screen density of 282 pixels per inch, which, as you can imagine, means some onscreen objects are going to be very, very small (check out that still photo of Windows Media Player in our gallery to see what we're talking about). Other than that lack of optimized apps -- a problem for every high-res notebook -- the screen is quite nice, with good color reproduction and decent viewing angles. As for the rest of the specs, we don't know much, expect that it will have a mix of Core i5/i7 processors (whether that means Haswell or Intel's fifth-generation chips is a question for another day). 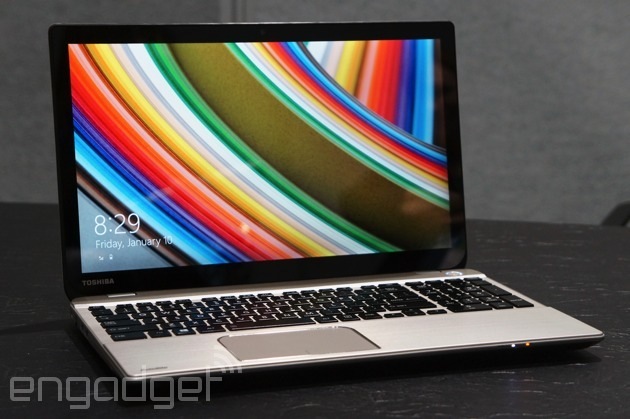 We suppose all will be revealed when this finally goes on sale -- sometime "mid-year," says Toshiba. For now, enjoy the hands-on photos. When I sat down for my first demo with Tactus Technology, it felt like I was witnessing magic. 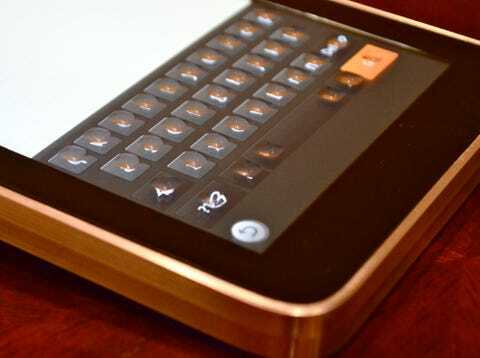 A completely normal-looking, smooth-screened tablet had suddenly transformed into a device equipped with a little, bubbly keyboard. The buttons had risen up out of seemingly nowhere. Then they melted back down into the screen. Tactus creates hardware that morphs. 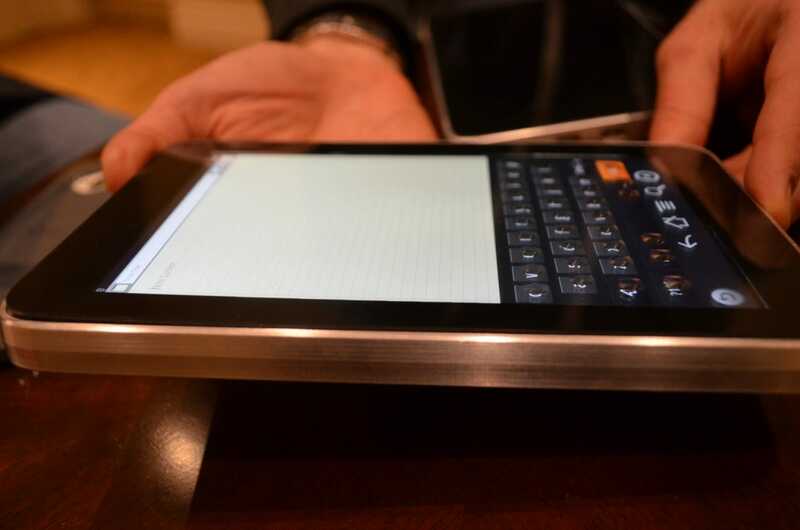 It makes tactile buttons grow out of a screen when you need them, and disappear when you don't. You can activate buttons over your keyboard to make typing easier and more natural, or control buttons to enhance gaming. Tactus has created a thin layer that can replace the Gorilla Glass on top of the touch sensor and display layers of a smartphone or tablet. The surface of that layer is a semi-elastic polymer under which there are little channels filled with a special transparent micro-fluid. To make buttons appear (for a keyboard, a game controller, whatever), you can increase the fluid pressure in a certain area. The added fluid physically stretches and raises the polymer surface. Presto! Real buttons on your previously flat screen. Last year at CES, Tactus wowed crowds when it publicly demonstrated its technology for the first time. This year, Tactus is ready to bring its product to market. Tactus CTO Micah Yairi told Business Insider that the company will be releasing a smartphone or tablet cover this year that you can use to make the buttons appear. Yairi also said that Tactus is working on partnerships to get Tactus laye! rs built into new devices within the next several years.